We take great pride in raising the healthiest fowl here at Johnnie Jumper Farm that we possibly can. We spend 7 days a week tending to the birds. Below you will find a little bit of insight on how we do things here at Johnnie Jumper Farm. After a long day of work during breeding season we collect our eggs from individual breeding pens and mark them with a specific number to ensure we do not get them mixed up. We store them in safe compartment, tilting the eggs from left to right every day to help the hatching percentage. Try to avoid cleaning dirt off the eggs because this may clog the pores and reduce the hatching percentage. When the eggs are ready we place them in an automatic turning incubator at 100 degrees Fahrenheit to begin the 21-day incubation period. We have a barn housing three of these large incubators. When placing the eggs in the incubators, place them with the pointy side down because there is an air pocket on the top side of the egg which allows the embryo to breath. If the egg is placed the wrong way the egg will not hatch. On the 18th day of the incubation period, remove the eggs from the incubator and candle the eggs. Candling eggs using a flashlight, cup your hand around the egg and shine the flashlight through the egg to check and see if the egg is fertile. If you cannot see the light through the egg, then it is fertile. If the egg glows bright, you need to discard the egg because it is infertile. 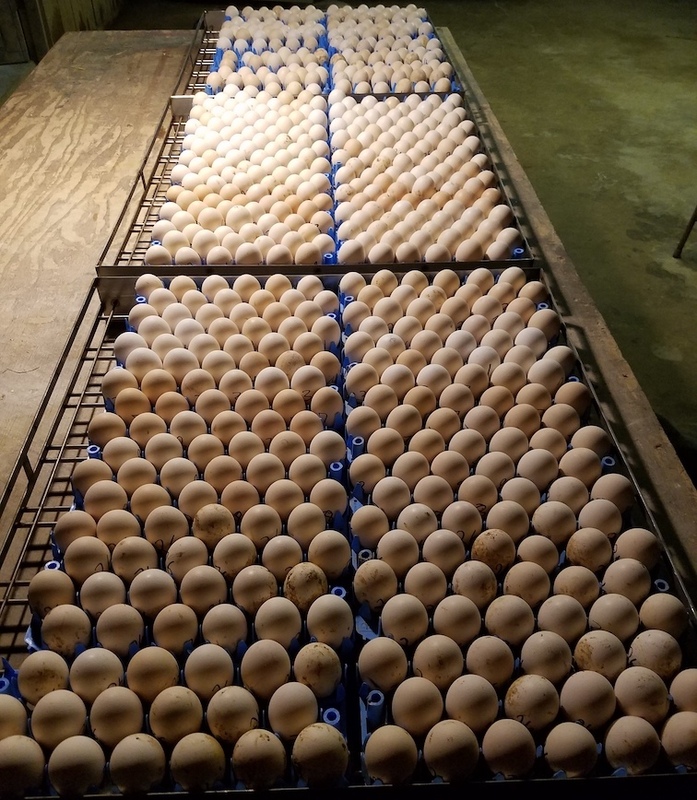 At this time, we place all fertile eggs back into the incubator in individual sections according to the number on the egg to prevent our different bloodlines from becoming mixed during the hatching process. On the 21st day of the incubation period we will pull the chicks out of the incubator and give them a unique marking according to their bloodline. After marking the chicks, we place them in our indoor baby brooder section of the barn equipped with heaters and lights (red light bulbs preferably to prevent them from pecking each other) where they will stay for the next 3 weeks. 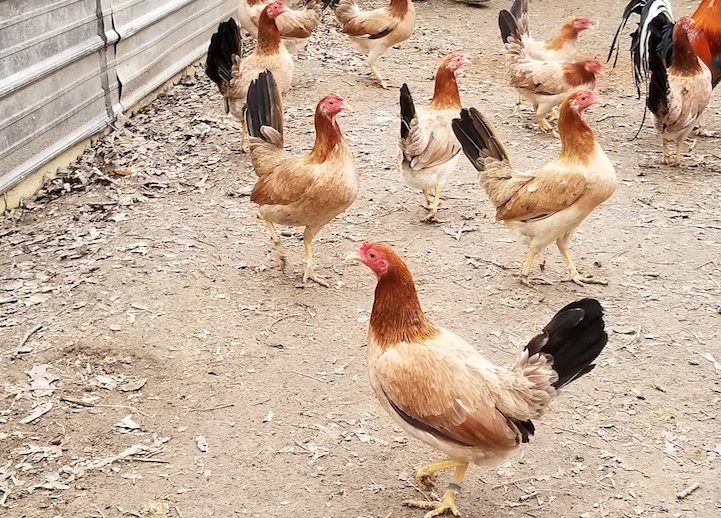 It is a good idea to have an extensive vaccination process due to the many different diseases in the game fowl industry. We generally vaccinate our baby chicks no later than 2 weeks old so that we can get them out of the brooders and on to the range area as soon as possible for maximum plumage. Allow at least one week after vaccinating before exposing the chicks to the range area though. Pox, Newcastle, Merricks, and Coriza are four of the many diseases that we vaccinate for. Pox, for example could start out as a scab around the mouth and/or eyes of a chick. Within three days many more of the chicks could be infected due to them drinking from the same water supply. It is important if you notice something like this to segregate the chick from the rest until you can identify the problem and medicate properly. 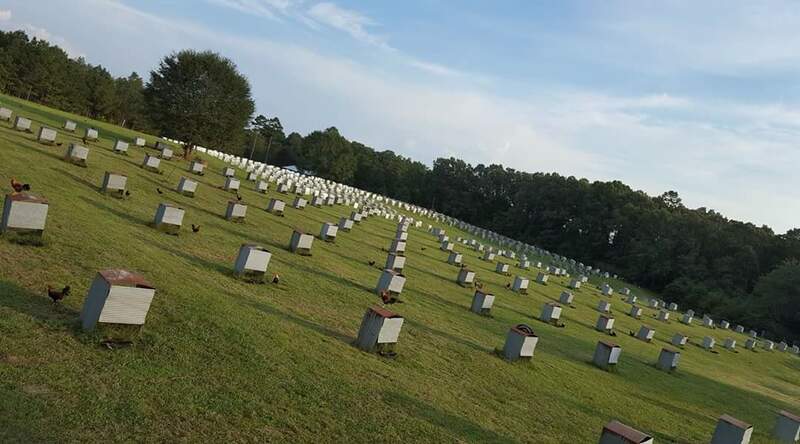 Our range area consists of plenty of grass, trees, and shrubs. This gives the chicks ample room to run free and roost. We have found that ranging your birds is the healthiest thing you can do for them. Make sure your birds have fresh water every day. We like to feed pellets with no less than 18% protein every day and scratch grain on 3 days of the week. It is also a good idea to give a good wormer and vitamins at least twice a month. We personally like to use a powder water soluble mixture and run it for three days in a row then back to fresh water. Using this method, you should have no problem raising very health brood fowl.